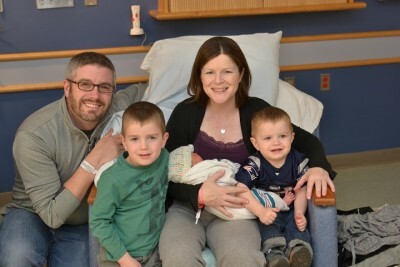 MiniMarr – The online home of Patrick, Laurie, angel Brienna, Peter and Bailey. 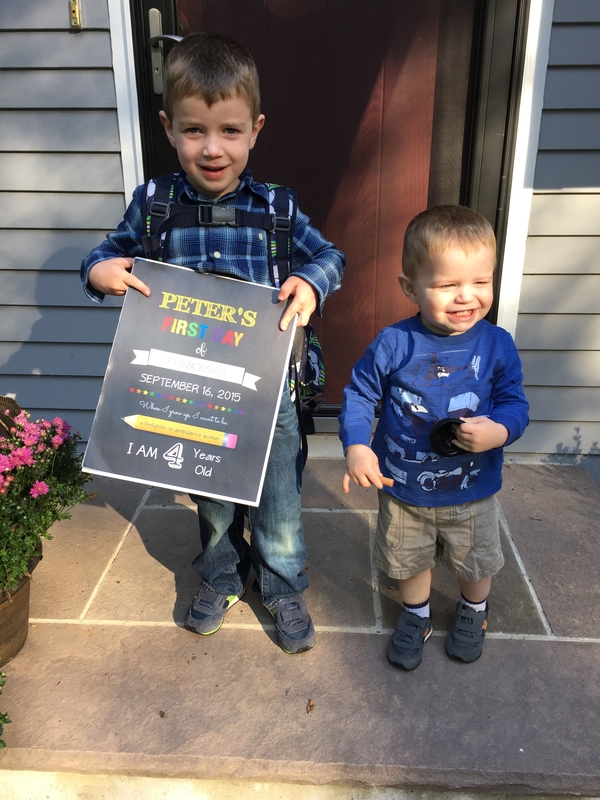 Pete started preschool again today, and could not have been more excited. He went to the same school last spring, and when I asked him what he was most excited about, he said “playing with the Paw Patrol toys”. But after orientation on Monday, when he got to see some of his friends from last year and meet some new friends, he decided he was most excited about playing with his friends. He was very sad to learn two of his friends are now in Kindergarten, and informed me that he will “never ever go to school every day” … hopefully he changes his mind by next year! Pete seems to have grown up overnight. He literally woke up from a nap a few weeks ago and Pat and I were both convinced he had a growth spurt. All of his pants were suddenly too short and it’s like he’s this grown up version of himself … he is 4 going on 14, no doubt about it! When we dropped Pete off, James made himself at home, pulling out a chair and sitting down to color. When I broke the news that Pete was staying at school and we were leaving, he ran right up to Pete and said “I love lou”. It was so sweet! Pete gave us both hugs and a wave and that was that. At pickup, he told me he had an “awesome” day and that he wants “more school days and less mama days, because school is a lot more funner”. My heart may have cracked a tiny bit, but I couldn’t be happier that he likes it so much! Pat and I are so proud of Pete. He’s a funny, smart, kind, confident little boy and we can’t wait to see what’s in store for him this school year! Author lausPosted on September 16, 2015 September 16, 2015 Categories Pete2 Comments on Pete’s First Day of Preschool! My sweet, sweet baby James is no longer a baby. He hasn’t been for some time, but it’s a hard pill for this mama to swallow! 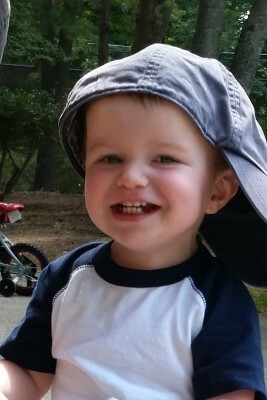 Sometimes, I feel like he was just born and yet here he is, a toddler well on his way to boyhood. James loves to eat, and loves to run to his high chair screaming “eeeaaattt” until he gets his food. Some days he’s picky and only eats what he wants, but then other days, he’ll eat anything and everything that’s put in front of him. If he likes what he’s eating, he nods his head up and down and wiggles his eyebrows and it’s one of the funniest things I’ve ever seen. He makes us laugh out loud all the time. James loves, loves, loves to sing and hearing him sing his favorite songs (or demand that they be sung to him) is just adorable. His current favorites are “row row” (row, row, row your boat) “baa baa” (baa baa black sheep) “bus” (the wheels on the bus) “ABC” (the ABC’s) and “heeeeaaaad” (head, shoulders, knees and toes). We are constantly singing songs and sometimes he’ll let us sing what we want, but other times he creates his own little medley and it’s hard to keep up with his requests! When he hears a song he likes, he dances and moves his head side and side and smiles and laughs. It’s adorable and he’ll do it whenever the mood strikes him! James loves to snuggle, and I am soaking it up as much as I can. He’ll be mid run around the house, but stop and ask for a hug and a kiss and then continue on his merry way. If I’m rubbing his head or his back, or have a hand on his belly and happen to move it, he’ll reach over and it put it right back where it was. It’s so sweet and I selfishly let him fall asleep in my arms because I just cannot get enough of him. The sensation of feeling him drift off and knowing that he’s so content and secure is one of my all time favorite things. He might be running full steam ahead toward being a big boy, but he’ll always be my little baby. He loves to count, and can count to 12 when he feels like it. He and Bailey are best buds. He chases her around the house and is way too rough with her sometimes, but she is so patient and good to him. Probably because he feeds her more than anyone else in the house. If Bailey upsets him though, he legit yells at her (I can’t imagine where he learned that) and makes me laugh because he’s so angry, but so little and she pays zero attention to his outrage. He loves hats, but only wears them backwards. He will get as close as possible to my face or Pat’s and just say “hi mom” or “hi dad” over and over again and then plant wet kisses on us. It’s hysterical and I love it. He tells us “I love lou” all the time and it never fails to make me melt. He is so affectionate and it’s the best. He whispers sometimes, and it’s adorable. I never thought this could be possible, but he may in fact talk more that Pete does. If he misplaces something (or someone) he holds his hands up and says “where it go?” in his high-pitched little voice. It cracks me up every time! His smile is the best. He often scowls (it’s usually fake) but then he smiles and it just lights up his whole face and it’s one of my all-time favorite things to look at. *He’s just about nineteen months now. And to think I actually started this post when he was sixteen months .. oops! Our sweet Brienna Marie would be six years old today. Six. Six feels hard. She would be so much of her own person at six and it makes me sad that I don’t get to watch her grow up. As more time passes, I feel like I know less and less and I hate it. When kids are young, you can assume certain things, certain likes and probably dislikes too. But a six year old? A six year old is becoming their own person in so many ways … would she be sassy or sweet? Precocious like her little brother, Pete? 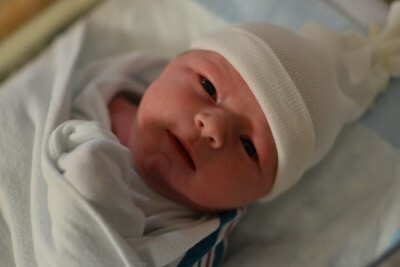 Or rambunctious like her littlest brother, James? I found myself walloped with grief this year. It took me by complete surprise (although at this point, I should know never to be surprised) and I was borderline incapacitated with sadness. It is so difficult to put into words the pain that her loss causes. Six years feels like a lifetime, but it’s also passed in the blink of an eye. 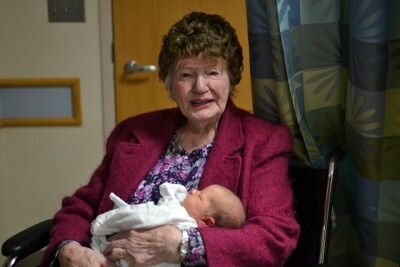 Pat and I talk about how sometimes, we feel her loss even more now as our family grows. We watch our friends’ daughters play together and know that Brienna should be there with them. 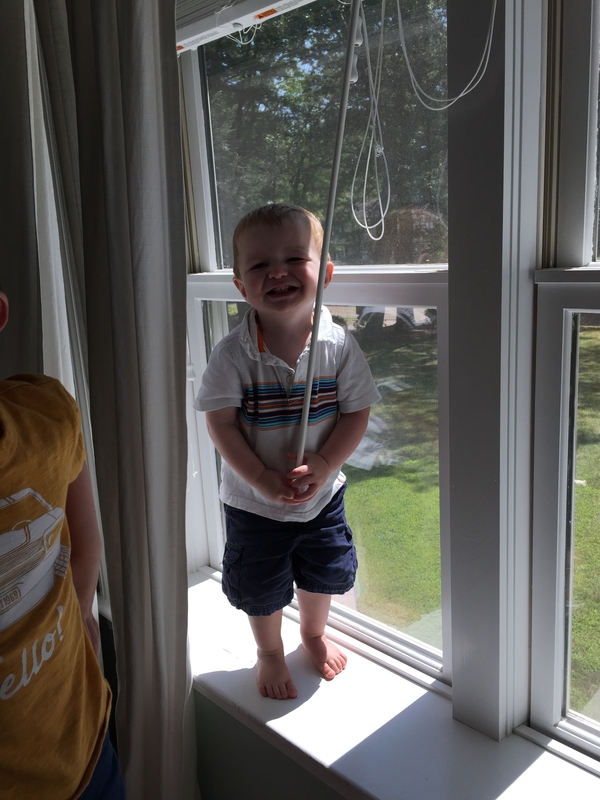 We look at the boys and laugh, thinking about their older sister rolling her eyes at them and their loud, messy ways. Pete tells me things about Brienna all the time. 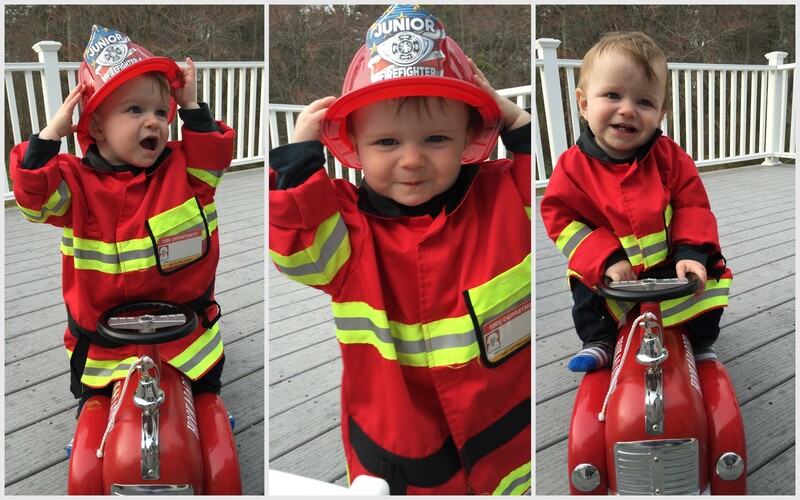 He talks about her favorite color or how he takes her for rides in his pumper truck. I envy his innocence. And I love to hear about her from his perspective. Brienna Marie, you are sorely missed. But you are oh so loved. Happy Birthday, sweet girl. Mother’s Day is a day of celebration for sure, because every mom deserves to be recognized for their hard, selfless work. But it’s also a day of reflection for me … I can’t help but think of all the moms out there who are without their babies. Who parent from afar because their children have gone before them, the cruelest twist of fate. I am one of the lucky moms, because although Brienna isn’t here, Peter and James are. They light up my life every single day. Motherhood is easily the most challenging job I’ve ever had. And yet at the end of the day, when the tantrums are over, the stinky feet are washed and I snuggle the boys to sleep, it’s all worth it. All the stress melts away as I sing to them and watch them drift off to sleep. It is truly a gift to be a mom. Despite it’s challenges, it’s the best, most rewarding job and I wouldn’t trade it for anything. Because I got to be Brienna’s mom, I’m a better mom to Pete and James. She made me who I am today and I couldn’t be more proud to be her mother. We had a picnic lunch at the cemetery today. 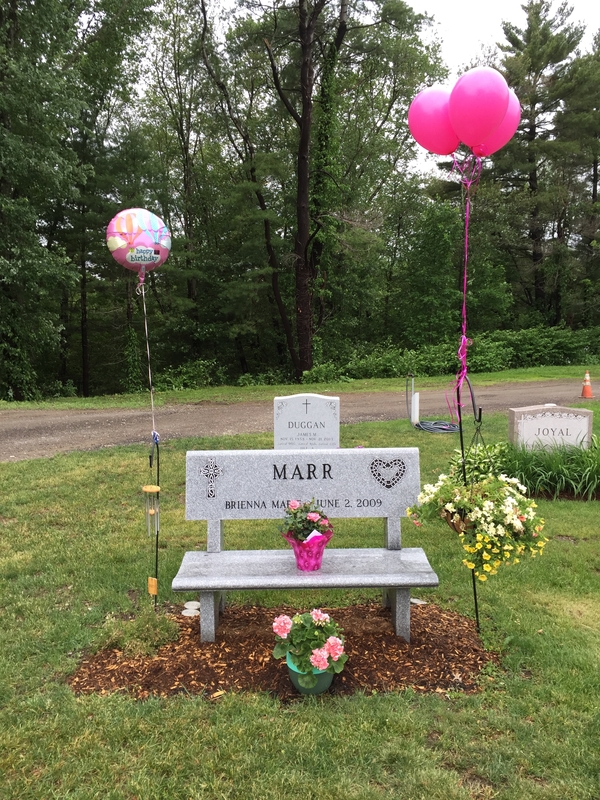 We planted new flowers and mulched the beds around Brienna’s bench. Pete and James helped every step of the way and their sweaty, red faces made me want to freeze time just for an instant. All three of my babies together. Maybe not in the way I first envisioned, but together all the same. Just what this mom wanted for Mother’s Day. Pete can be so serious and timid sometimes, and I love watching him let loose with his blue Jeep. He takes off as quickly as possible with this huge smile on his face and it makes me so happy to watch him enjoy something so much. 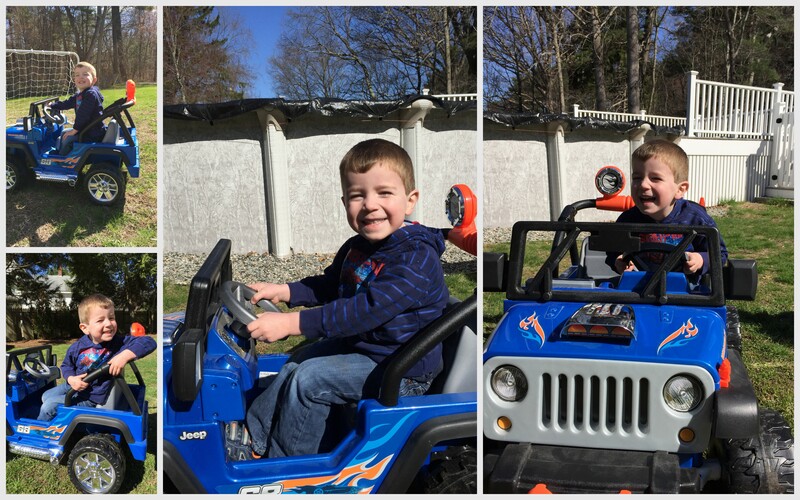 Every day, he says “wow, I really cannot believe you guys got me my very own blue Jeep!” The novelty does not appear to worn off yet! Pete is very responsible and follows the rules: he can only go fast on the grass (Pat removed the governor approximately 4 minutes after Pete took it for his first spin) and if James is a passenger, he has to go slowly. Experiencing the pure joy and happiness through Pete and James’s eyes is awesome. 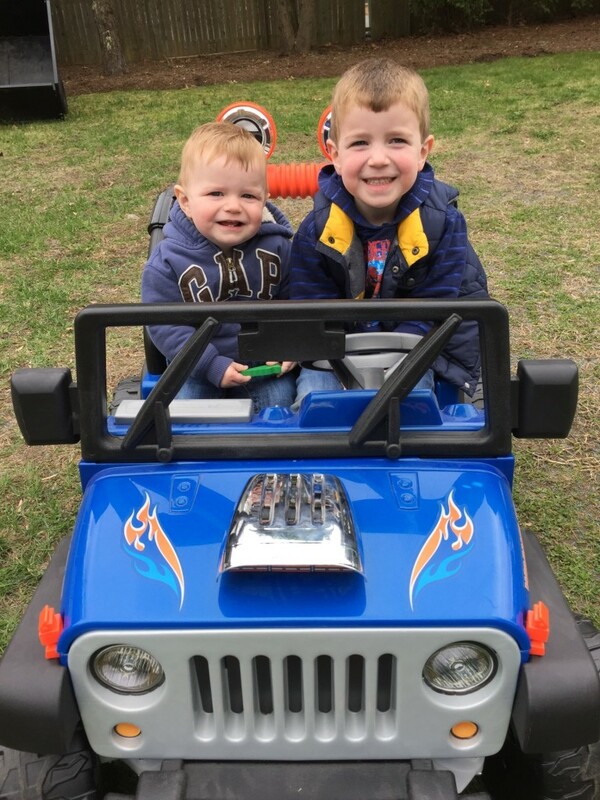 It’s one of those unanticipated perks of parenthood and I just love it … I think their smiles mean they do too! Author lausPosted on May 8, 2015 May 9, 2015 Categories James, Pete2 Comments on Blue Jeep! Happy 4th Birthday to our sweet, sweet Pete! Pete is growing up way too quickly and sometimes looks like such a big boy it makes my heart hurt. 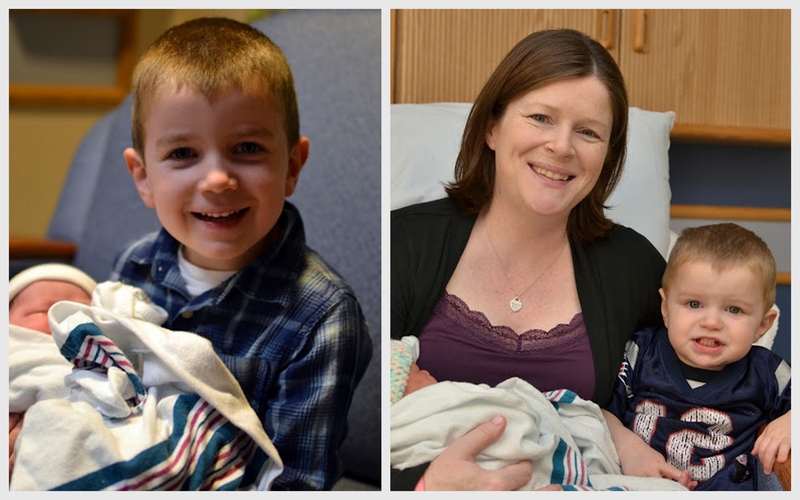 I cannot believe he is 4! He has been so excited to be “2+2” for so long and has been asking about his birthday for weeks. I think it made Pat and I equally as excited for his big day! 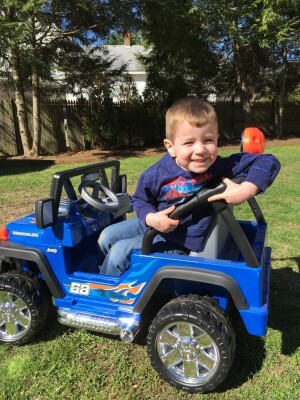 I find it very difficult to adequately capture Pete with words … he is just this amazing little boy with such a big personality that I feel like writing about him will never do him justice. You have to experience him to understand him, if that makes any sense. Pete is a great kid. He can be oh-so-challenging at times because he is precocious, incredibly stubborn (no idea where he gets that from), opinionated and sometimes just too smart. But Pete is also one of the kindest, most caring, empathetic people I know. He cares so deeply about people, his animals and toys and the creatures he imagines. He is the best big brother I could imagine to James because he truly loves him and wants the best for him. We joke that he is “parent #3” because he often yells out “baby electric!” or “baby at the water bowl!” when James is getting into mischief. Pete is a chatterbox. There are days and nights that he never stops talking (literally, never) and Pat and I just look at each other and sigh smile because we cannot keep up with his train of thought. He’ll talk all through his bedtime routine, while we’re reading books and singing and sometimes he’s still talking as we close his door and say goodnight. We’ll hear him talking to his animals and reading them stories and he often falls asleep mid-sentence. His imagination is incredible and he weaves these intricate stories that make complete sense to him and he is never not thinking about something or another. He is so inquisitive and I thank the creators of Google on a daily basis! Mama: Pete! I forgot to sing you songs! Pete (on a fake phone): What’s that Mom? I’m on the phone. Pete: That’s okay Mama (hangs up fake phone). I’ll just send them a text message. Pete: Mmm, mmm, mmm … that is one good smoothie. Thanks, Pete, myself! Miss Kathy : Pete, do you want to ask Miss Jessica about that? Pete (thoughtful for a moment): No. That actually won’t be necessary. Pete: Sigh. Oh Mama. How do you think our old neighbors are doing without us? Maybe we can bring them flowers to make them feel better for missing us. Pete: Well Mama, I’m not new new like James, but I’m still kinda new. Pete: Mama, I think we need some privacy here. Mama (confused): Oh, okay. Why? Pete (sighs and rolls his eyes): Oh mama, it’s just an expression. 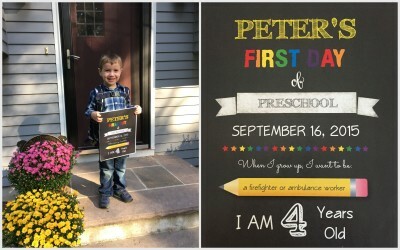 Pete seems to possess a wisdom beyond his four short years. We often hear that he is an old soul, and I think I have to agree. He has this intangible quality about him that I find hard to even describe … I am absolutely fascinated by him on a daily basis. We are so, so proud of Pete and I feel so incredibly lucky that I get to be his mother. He is just such a special little boy and has no idea how much joy he’s brought to Pat and I. When Brienna died, it was like someone turned out the lights … but then Pete came along and turned them back on for us. I’m not sure he will ever truly understand what a gift he is. 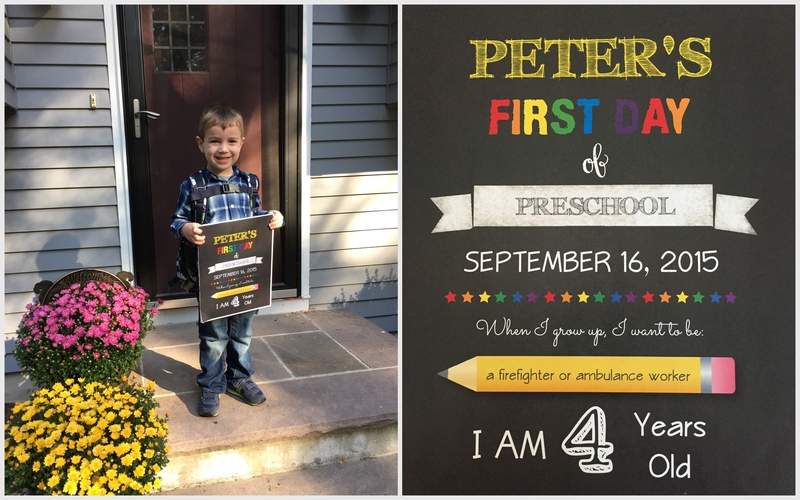 We love him so, so much and are excited to see what’s in store for our favorite four-year-old! Author lausPosted on April 30, 2015 May 8, 2015 Categories Pete2 Comments on Happy Birthday Pete! Pete is on vacation this week from preschool, so today we went to a “Touch-a-Truck” event to benefit one of the local schools that caters to kids with disabilities. I told Pete about it last night, so he was very excited. As soon as we parked, he unbuckled as fast as he could and was ready to leap out of the car. As we walked towards the event, he was jumping up and down proclaiming “this is going to be the best day EVER! !” It was pretty adorable! We went to one of these in RI before, but Pete was hesitant to go on any of the trucks right away. 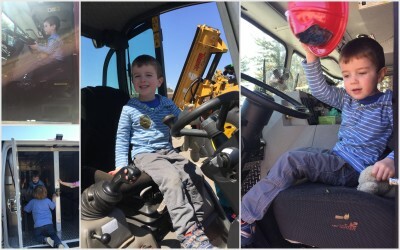 Today, his friends Sadie and Liam were with us, so he had all the confidence in the world and bounced from truck to truck. He started on the fire truck, spent most of his time in the Police Prisoner Transport van (hopefully not at all indicative of the future!) and ended the day on a gigantic backhoe. He informed me as the morning went on that he wouldn’t be smiling for any pictures “because it takes a long time for a smile to pop up” but I did finally capture one! Jimbo couldn’t do too much at the event, but he loved his fire hat and asked to put on Pete’s fire jacket when we got home. 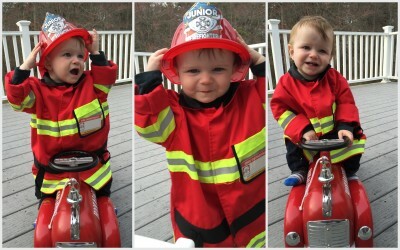 Cutest little fire chief I’ve ever seen! James is ONE. How that is possible is beyond me. I feel like he was just born and yet I cannot imagine life without him either. This year absolutely flew by! We celebrated James’s birthday with our families, and I think he quite liked being the center of attention. 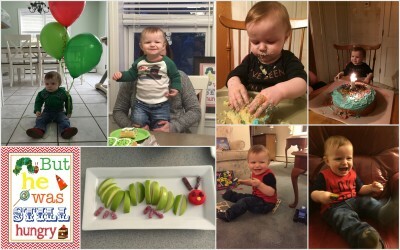 He had cake Friday night at my parents house for the first time, and loved it. He was slightly skeptical at first, but once he figured out what it was, he dove right in. His birthday party on Saturday was a The Very Hungry Caterpillar theme, because it just seemed so appropriate given his love of food! James had his one-year doctor’s appointment today and weighed in at 21 lbs. 8 oz. and is 30″ tall, which puts him right at the 50th percentile – I’m thinking that maybe his height at 9 months was off! We just love our little Jumbo Jimbo and can’t wait to see what’s in store for his second year! Author lausPosted on March 5, 2015 September 16, 2015 Categories James1 Comment on ONE!!! Pete loves taking care of things, he always has … he takes care of his toys and always takes care of us if he thinks we’re not feeling well, but he always takes especially good care of his animals. For Christmas, Santa brought him a new doctor’s kit and a veterinarian’s outfit. 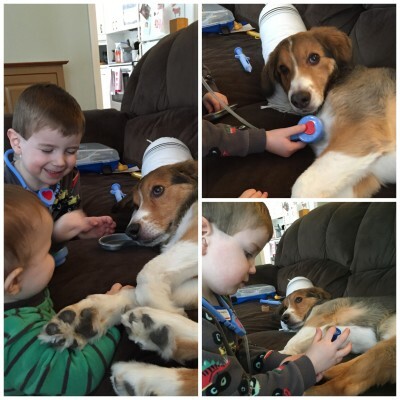 He loves it and has spent countless hours being a doctor or vet and helping anyone and anything that needs it. Today, he decided to take care of Bailey, and she surprisingly let him! He listened to her heart with his stethoscope, gave her medicine to drink, gave her a shot and she even let him put a bandaid on her paw. I was very impressed with her patience and I absolutely loved watching him take such good care of and talk so sweetly to Miss B!